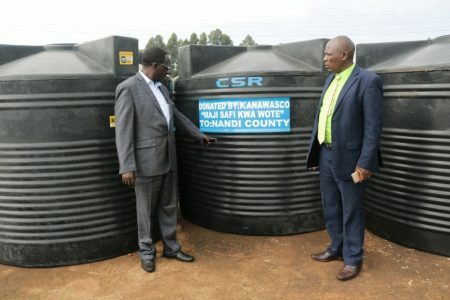 Kapsabet Nandi Water and Sewerage Company have donated five water tanks to the County Government of Nandi as part of the company’s efforts to support Nandi residents through its corporate social responsibility. The water reservoirs were handed over to Mr. Solomon Mang’ira, the Chief Officer for Lands, Environment, Natural Resources and Climate Change by Mr. Kiboi KANAWASCO managing director. Each has the capacity of 5,000 litres. The facilities are expected to benefit residents from different sectors. Each reservoir has the capacity to serve hundreds of residents, according to officials from the water company. While handing over the tanks at an event which took place at the water company’s offices in Kapsabet Municipality, Mr. Kiboi said the donation intends to respond to the needs of Nandi residents besides providing them financial solutions. “KANAWAWCO strives to improve the welfare of the communities we serve. The type of life led by an individual and what affects their domestic needs influences their efforts to achieve economic transformation and financial independence,” said Kiboi. Speaking at the event, the County Chief Officer for Lands, appreciated the water company for the support, adding that the donation is an indication that KANAWASCO cares for the development of the county, a situation that starts with improvement of citizens’ welfare. He urged the beneficiaries who will receive the tanks to use the reservoirs responsibly. The Chief Officer said that water is a constitutional right for every Kenyan. He said that Governor Sang is committed to working with all stakeholders and partners to ensure safe, clean and enough water for all.